Okay, I need to admit this right off the bat, I love EVERYTHING about the way that Tim Holtz lives! 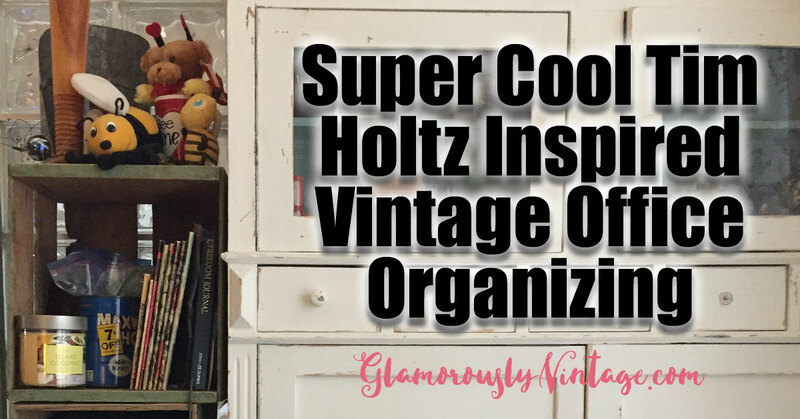 He has amazing vintage stuff, decorates like my Grandma and is amazingly creative! Today’s post is going to take a peek at how he uses vintage and see how we can incorporate that into our office spaces!! All pictures are from his post … Cha 2015 Ideaology. 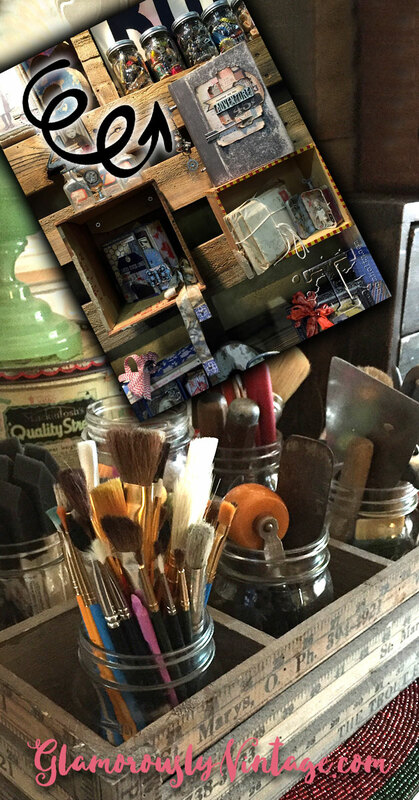 Tim Holtz has fantastic ideas on how to use vintage in such amazingly cool ways! 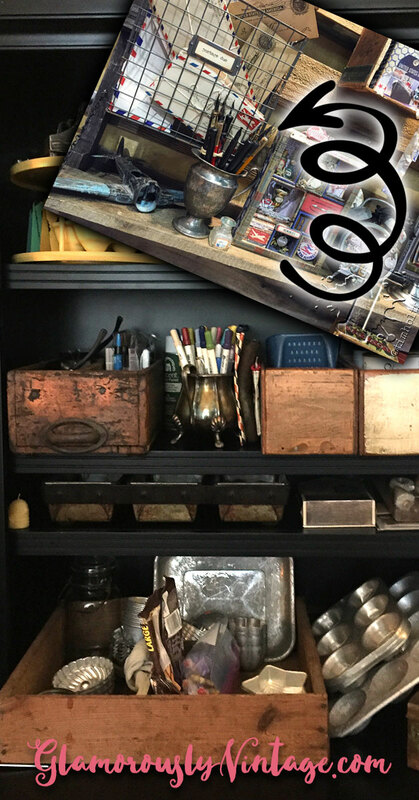 With that in mind, I thought it might be fun to see how I incorporate “Tim Holtz Style” in my home office organizing! This piece from the Ideology booth is so Wicked Cool! It is so creative with all the drawers and different handles. I use this kind of furniture in my office too! I have an old dresser that I have repurposed with Annie Sloan chalk paint and bit of elbow grease. The cool thing about chalk paint is that you don’t have “prepare” the piece, you can just paint right on it after giving it a bit of a clean. This has changed my life as I am not “sand, sand, cheesecloth, sand” kind of girl. 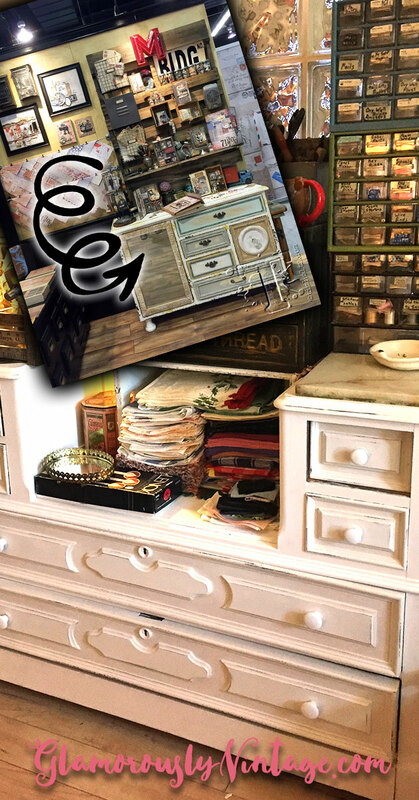 That said, I do feel like there is something added to this piece with the different colors and textures on the drawer and door fronts….hmm may need to think about tarting mine up a bit! I got this one at a thrift store, scoring it right as it was coming in off the donation truck. It was ugly and brown so I painted it white. The neat thing is that has a hidden drawer in the bottom! I LOVE using glass jars to keep things that are funny shaped in my office. In this picture Tim is using all large mason style jars. I tend to like a little more eclectic look. I find all different kinds of jars including the ones that are for the kitchen with the orange seals. This picture is a cool box that I have made out of rulers and I struggled with how to keep all my cool old man tools organized in there! I LOVE using the rollers, scrapers and vintage tools, but if they were in a closed tool box I would never go to the trouble to get the out. Mason glass jars were the perfect solution as they are clear and readily available. Having them right at hand means that I will use them more and make my life easier! Check out our glass jars for sale on Etsy! I have vintage metal all over my house! I use an old silver plate sugar bowl to hold my Q-tips in my bathroom and all kind of silver pieces in my office to hold pens, pencils and even tools! Finding cool metal stuff is generally pretty easy, definitely check out estate sales or antique auctions. Etsy has a lot great silver plate stuff too! DO NOT get all stressed out and think that you have to keep your silver polished. When you have these kinds of old pieces it is the patina and age that is what makes them special. As you can see in the picture, I also use all kinds of metal in my office! My favorite thing ever is to use muffin tins when I am working on a project. That let’s me make collections of bits that want to have all together. I also use those jello molds and tins for keeping different things organized together! Check out our vintage organizing tins for sale on Etsy! Okay now let’s talk about the workhorses of your office…Storage! Old crates like this are amazing for storing things on the wall. As you can see the divider in the middle is just like a shelf in a cabinet. I have a series of these kinds of crates in my office that I just have stacked up next to my dresser and they are amazing for keeping all kinds of things in. I also use boxes (like soda crates or old drawers) for storage. They are super fun to have around visually and are great for moving things all at once! Oh, oh, oh and I LOVE using old wooden tool boxes for this too! So handy for keeping things together and portable. As you start to find these kinds of boxes you will notice some have one divider, a couple or even a whole series of them (these were originally used for milk bottles or beer bottles). I am using little berry baskets I got at Michaels to keep things organized inside of this crate. I know that the only times I have regretted getting something is when I have rushed and just gotten “anything” instead of the perfect thing that would make my space special. I find lots of great organizing things at estate sales and antique auctions. Yard sales are definitely hit or miss for this kind of thing and while thrift stores are great for some things (like glasses), they are not great spots to find these kinds of organizing bits. Because I am such a fan of this kind of decorating, I actually opened a shop on Etsy that has great old pieces like I use in my office! 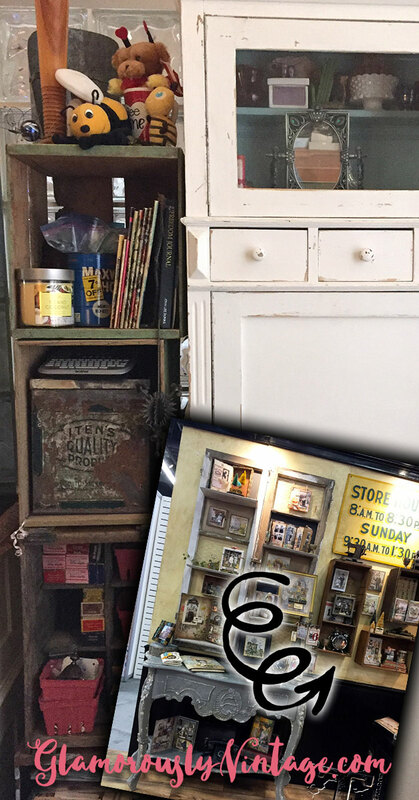 Check out all the vintage storage or see the vintage containers and tins!